To visit artist Iman Soleh’s house in Ledeng, Bandung, one must walk through an alley even motorcycles cannot pass. Despite this limited access, his house, located behind the busy public transportation terminal of Ledeng, is the center for community-based theater Celah-celah Langit (CCL), also known as the Ledeng Cultural Center (CCL). His large front yard, where children can be seen running around while chickens peck the dirt, is where rehearsals for CCL productions take place, including for the recent play Tanah: ode kampung kami (Land; ode to our kampung) presented at Taman Ismail Marzuki cultural center in Cikini, Central Jakarta. The theater community stages performances there around three to four times a year. Iman said they also hold surveys and perform in different villages to bring art closer to the people. “I am not against art and cultural spaces but I think that art should come to the people,” he said. Iman, 47, a seasoned theater player who has joined different theater companies in Japan, France, the Reunion Islands and Australia, said cultural centers should be built near narrow alleyways where people live. “Even in the most densely populated area… That’s where cultural centers should be built,” he said at Taman Ismail Marzuki recently. Iman was in Jakarta recently to prepare for the play Tanah. His area in Ledeng has traditionally been an arts and cultural hub, Iman said. The terminal building in Ledeng changed the social landscape there with the communities that grew around it. However, it isn’t the government that initiated any arts or culture conservation projects there. Iman explained the leader of his neighborhood was a puppet master; not far from his house lived a calung (traditional Sundanese bamboo musical instrument) player, and a bringbrung (traditional Sundanese percussion) player. A traditional Sundanese martial art pencak silat center is located near his house too. “These rich culture and art communities should not disappear into thin air because they are the ones who bring art closer to the people,” he said. “We are the ones who become snobbish and make barriers because we want it to be representative. I think art should be representative, not the building,” he said. That is why he opened his house to CCL. Many have often wondered how his family can retain privacy in his very open home. “If you want your lives to be beneficial to other people, you have to open your house [to them],” he said. During Iman’s childhood, one of his neighbors used to leave a water jug in front of her house for people who were thirsty. “I would walk pass her house and drink her water and then shout ‘Hatur nuhun bu!’,” he said, which means thank you in Sundanese. For the play Tanah, 25 people stayed in his living room. “But they are so diligent,” he said. “Learning about art is learning about life. When learning about beauty, the first thing you have to do is learn about cleanliness,” he said. Iman plans to set up a small library so children can come and read there. Before the center was called Celah-celah Langit, the place was already a hub for Bandung artists. Iman said poet Acep Zamzam Noor, painter Tisna Sanjaya used to hang out there. It was named Gang Bapak Eni Community, after the name of the street. After the fall of president Soeharto in 1998, the community was called Celah-celah Langit. “Because we can see the sky from the front yard,” Iman said. A group of international actors from Germany, Brazil, Australia, Japan, in 2007 stayed with CCL for three months in an Indonesia-Australia collaboration between CCL and the Sidetrack performance group. Their collaboration gave birth to a play called Tangled Garden directed by Brazilian Carlos Gomez. Iman said he grew up surrounded by the arts in Ledeng. The idea of studying theater came to him when he was studying acting and then directing at the Indonesian Arts College (STSI) — now the Indonesian Arts Institute (ISI). 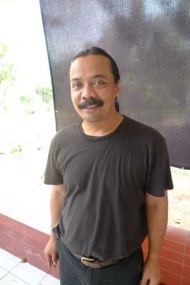 He is currently taking a postgraduate degree at the Jakarta Arts Institute. He joined the Studi Klub Teater in Bandung and then Teater Kecil headed by Arifin C Noor before travelling around the world. During his travels, he saw there was a gap between the arts and people in many countries. “I don’t want Indonesia to be like that,” he said. That is why CCL often performs in villages, to bring art closer to the people he said. “Art should be representative,” he said. That is why he always starts from facts when creating art. Iman likes to talk to people around him. After the dawn prayer at the mosque, he goes to the public transportation terminal and has coffee with the buskers there. “That way we can know what they are worried about,” he said. CCL is preparing three productions at the moment, including a children’s play, Iman said. Iman puts these plays together to preserve local art. “Art is the main ingredient in a social world. I don’t want our lives in Ledeng to be dry”.